G-Lon Middle Board BGA Reballing Stencil With Solder Paste. Phone X Middle Board Plant Tin Platform For Phone x Maintenance with exclusive pant tin kit designed. 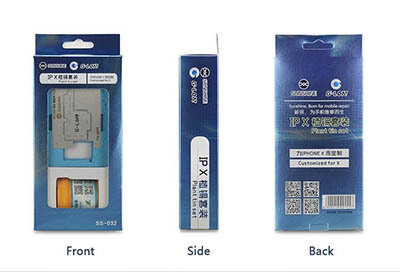 This set of tools breaks through the problem of low success rate of traditional mainboard repairing. Greatly reduced the difficulty of motherboard maintenance. The mystery lies in professionalism of the soldering paste. There is no different between this product and original middle layer tin. The tin melting point of the CPU area is slightly lower than the that of surrounding. This solder paste uses the principle of temperature difference, Easily blow CPU without touching the peripheral accessories. Within the fine temperature difference, Makes the entire maintenance efficiency greatly improved. Even green hands can plant tin perfectly.